soft soil; Operating Weight 119 lbs. ; Fuel Capacity.95 gal; Forward only. 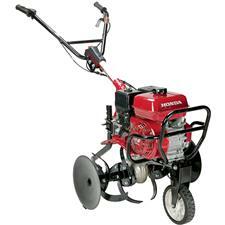 HONDA FC600: 5.5 HP; Tine Width 26.4"; Diameter 13"
Operating Weight: 130 Lbs; Fuel Capacity .69 Gal; Forward only. * Please call us with any questions about our tiller honda center tine lt/duty gas rentals in Sacramento and Citrus Heights, serving Auburn, Placerville, Woodland, Davis, and Elk Grove in the Sacramento area.